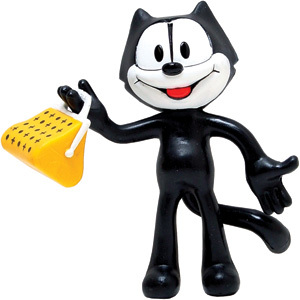 Felix the Cat is a lovable character that has been with us since the silent film era. The first incarnation of Felix is seen in Feline Follies – a 1919 Paramount Pictures short animated film. In the film, Felix goes by the name Tom Kat. There is confusion in Felix’s history regarding when he got his name, Felix the Cat, and who is credited with his creation. The conflict is between Pat Sullivan, the owner of an animation studio, and Otto Messmer, a cartoonist who worked for Sullivan. Messmer is credited as creator by many sources, yet Sullivan has always claimed he holds such title. In later 1919, the character starred in The Adventures of Felix and other short films, and his popularity quickly soared. A Felix comic strip was syndicated in over 250 newspapers internationally, and a new short film was created and shown every two weeks. These helped push Felix to superstardom, and merchandise started to pop up everywhere. Charles Lindbergh even brought a Felix doll with him on his flight across the Atlantic Ocean, and Felix has the credit of being the first balloon ever made for the Macy’s Thanksgiving Day Parade in 1927. By the late 1920’s “Talkies” – films with sound – were being released with animated characters, such as Mickey Mouse. Sullivan’s studio made several Felix short films with sound, but they were never as popular as the original silent films. A paper-maché Felix doll was placed on a turntable and under the burning studio lights while technicians worked on the character's transmitted image to get the correct definition. 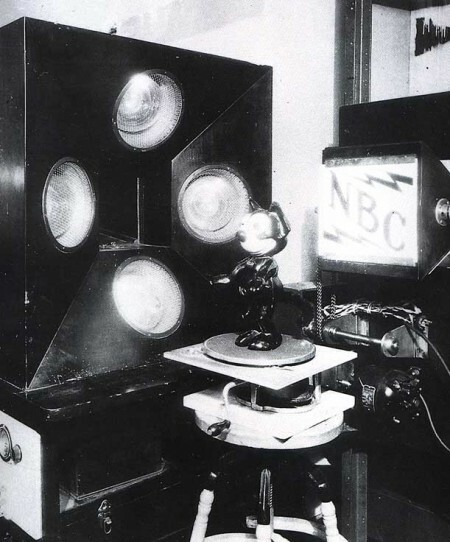 In 1928, Felix was chosen by RCA Television Studios to be the model used to precisely calibrate television transmissions for New York Channel #1. The paper-maché Felix doll was placed on a turntable and stayed under the burning studio lights for a few hours each day as the technicians worked on the transmitted image of Felix to get the correct definition. In 1931, the channel became part of NBC, and Felix continued to be the model used to test transmissions for nearly a decade. In 1943 the Felix Sunday comic strips were cancelled, but the Felix daily strips continued. At this time Felix was given his own monthly comic book, published by Dell Comics. Production started on Felix cartoons to be aired on television. Felix’s appearance changed slightly and his Magic Bag of Tricks was introduced, along with new characters, such as the Professor and Poindexter. More than 250 Felix cartoons aired, and were syndicated to run for over 20 years. In the 1980s, Felix the Cat: The Movie was released, ultimately being shown throughout the world before it ran on the Disney Channel for nearly 10 years. In the 1990s, a television series called The Twisted Tales of Felix the Cat was produced. Also created was Baby Felix and Friends, which has run on television in the Japanese market since 2000. In 2004 Felix the Cat Saves Christmas was released, adding to his notoriety. DVDs and Internet streaming of old Felix TV shows and short films created another surge in his popularity, and demand for Felix merchandise resurfaced. Today, the Felix character also graces clothing, video games and a slot machine at Bally’s Casinos. (According to felixthecat.com) In 1996, Felix was seen in advertisements for Wendy’s Restaurants and was offered as the prize toy in kid’s meals. He was also the official logo of the American International Carnival in 2004. Felix’s popularity has continuously grown throughout the years. He was featured in TV Guide as the 25th most recognizable and famous cartoon character in the world. Felix the Cat is a symbol of where we started in animated film, and he will always be remembered for being a part of the first television transmission signals. He is a loveable character that will continue to entertain generation after generation of Americans and people all over the world with his antics and his Magic Bag of Tricks. Do you remember following the tales of Felix?